"These creative cultural influences combined with the laid back California vibe and effortless California cool bring about the best environment that cultivates the spirit of California culinary creativity. 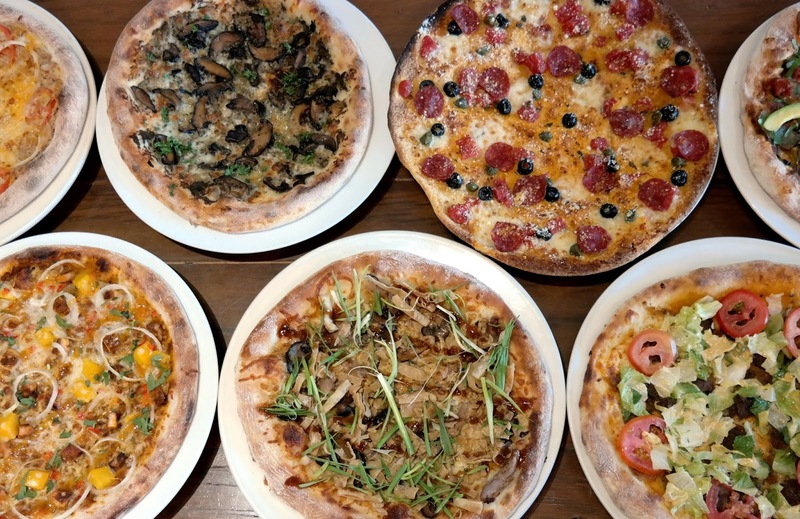 And this year is extra special because in celebration of our 20th year anniversary in the Philippines, we are not only introducing NEW California style dishes, we are likewise re-introducing the most popular pizzas of the past 20 years." said Bob Vallar, Marketing Manager of CPK Philippines. As for their new pasta offerings, there is the NEW Chicken Tequila Fettucine with chicken chunks, bell peppers, fettucine pasta, cilantro, and lime juice in a Cuervo Gold Tequila cream sauce and the NEW Cajun Spiced Jambalaya Pasta with chicken, smoked sausage, blackened shrimp, linguini pasta, & scallions in a Jambalaya sauce. And what is a CPK meal without a salad? Get fresh with their NEW California Harvest Salad, a CPK US recipe of baby Kale, Napa Cabbage, carrots, & steamed Farrow seeds mixed with red seedless grapes, strawberries, watermelon cubes, and almonds in your choice of Citrus or Blueberry Vinaigrette. Or, go for gold with their NEW Golden Pear Salad with fresh arugula, celery, parsley, candied walnuts, & cheddar cheese in a lime olive oil dressing. Buoyed by the extremely positive reception of introducing all NEW California inspired Rice Entrees for the very first time in the country last year, they are upping the ante by adding 3 All NEW Rice Entrees: the NEW Thai Calamari Rice with roasted peanuts, pineapple, chili peppers, scallions, & Japanese Furikake in a Sweet Thai chili sauce; the NEW Salisbury Steak Rice with a juicy Wagyu beef patty, caramelized onions, and a sunny side up egg in a demi-glaze sauce; the NEW Thai Coconut Curry Shrimp Rice with garlic, mushrooms, carrots, ginger, bell peppers, roasted peanuts, cilantro in coconut curry sauce. As NEW adventures are often best capped off with sweet endings, the have two all NEW desserts to satisfy your sweet tooth cravings: the NEW Banoffee Pie with bananas, coffee powder, cream, caramel syrup and candied walnuts on a graham cracker crust; and the NEW Nutella Cheesecake with hazelnut chocolate, cream cheese, chocolate syrup and whipped cream on a graham cracker crust. Other new dishes: Blackened Shrimp Grits + Rice, 4 Cheese + Pork and Beef Nachos, Chicken Parmigiana, Spicy Shrimp Poppers, BBQ Heirloom + Gouda Flatbread, Qorn Nuggets for Kids, Banana Avocado Shake and Mango Cheesecake Shake. Since CPK Philippines is also celebrating their 20th year in the country, they thought this would be perfect to stroll down Pizza Memory Lane. Which is why their pizza favorites over the past 20 years will be making a grand re-appearance on their NEW Menu. Because it's about time you stopped missing them and started enjoying them again! The Roast Duck Pizza, which first made a splash in our restaurants back in 1998, is finally back on the menu by insistent popular demand! So you can stop dreaming about and start feasting on this signature pizza of marinated duck breast, soy-glazed shiitake mushrooms, Mozzarella cheese, crispy fried wonton strips, scallions and Hoisin sauce. CPK’s Tuna Melt Pizza of tuna salad, mixed cheeses, tomatoes, 8, onions, had some pretty avid followers soon after its launch in 1998 as well. So much so that when it was momentarily removed from the menu some time back, customers were pretty vocal about demanding its reinstatement! Well, this ones' for you guys! The Wild Mushroom Pizza of sautéed wild mushrooms, mixed cheeses, fresh parsley and mushroom pesto sauce was a smash hit with the vegetarian customers when it was introduced in the year 2000. With more and more people deciding to eat healthier nowadays, it is a most opportune time for this premium pizza to make its comeback! The Cheeseburger Pizza was a novel idea when they first introduced it back in the year 2000. The whole idea was simple yet revolutionary with the cheeseburger ingredients of ground Angus beef, crispy bacon, mixed cheeses, caramelized onions, tomatoes, lettuce, & secret sauce converted into pizza toppings with our regular hand tossed pizza dough replacing the burger buns. But of course, the Cheeseburger Pizza comes with the unique California twist of adding fresh sliced avocados on top. For more information on their NEW Menu, watch out for the grand relaunch of their website www.cpk.com.ph, follow them on Facebook & Instagram @cpkphilippines, or visit any of their following branches: 2F Alabang Town Center; Ground Level W Global Center Bonifacio Global City, Taguig; Basement Level Century City Mall; and at the 2F Shangrila Plaza Mall East Wing.